I was very lucky to meet Lynn Hill, founder of Clandestine Cake Club, at the recent Squire’s Kitchen Exhibition. She was tucked away in a room full of beautifully decorated cakes that were part of a special Clandestine Cake Club competition. I wanted to share her story on Food At Heart as I was really inspired by what she has built with the club. 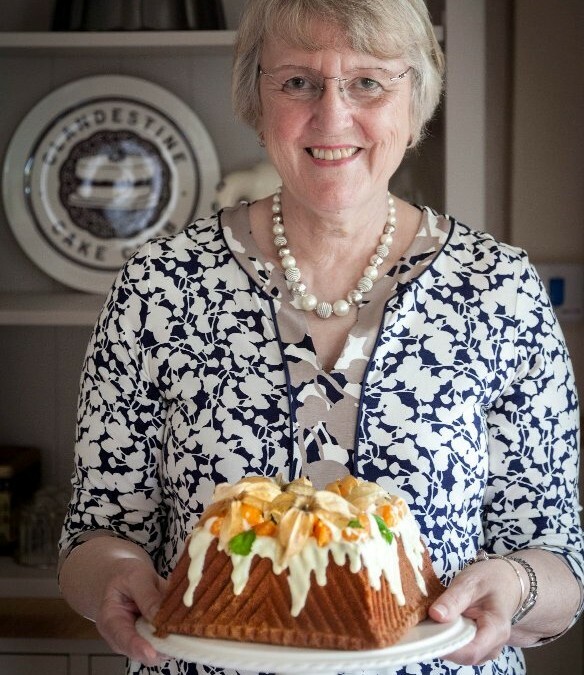 Lynn founded Clandestine Cake Club in 2010, initially running it at a secret location in Leeds. It was so successful that she soon had to ‘franchise’ the idea so others could host their own events. There are now almost 200 affiliated clubs across the UK and abroad. 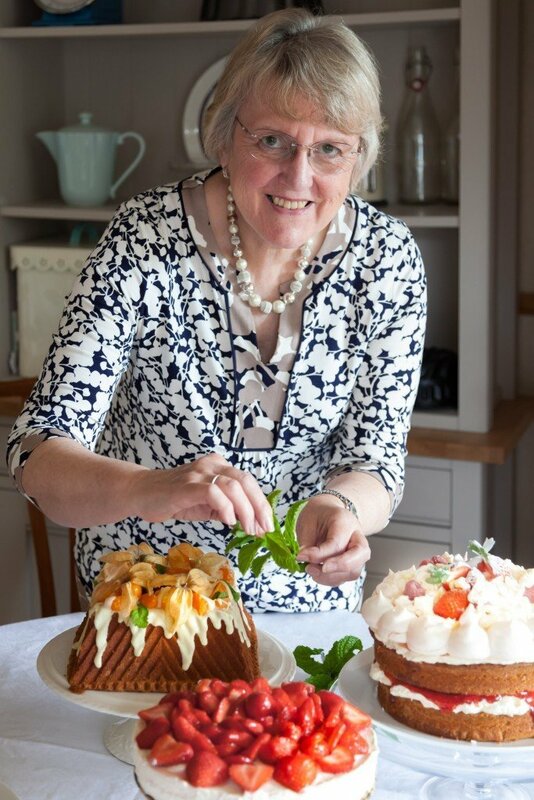 As well as being featured on The One Show and BBC Radio 4, Lynn has released two Clandestine Cake Club cookery books. How were you introduced to baking? I learned how to cook and bake at school, and my mother always used to bake. I remember she used to make some delicious breadcakes. In some ways it was probably no different from anybody else; you are surrounded by a mum who bakes and so that’s how you learn. I don’t have any formal training. Although I’ve been on the odd baking course at Betty’s, I don’t have any formal training. I don’t consider myself any different from any other home baker. When my children were at school I used to bake things to take to school fairs and to help the school raise money. Then when I started working part time (I used to work in the evenings), I baked things like cookies and brownies – all the things that you’re not allowed to take to a Cake Club event. I’d make them during the day and then take them to work as I used to see it as a team building exercise. I think it’s interesting how lots of people take cakes and cupcakes to work. It seems to break the ice a little bit; it brings people together. What is it about baking in particular that you really enjoy? It might seem silly, but when you’re weighing out the ingredients, it’s relaxing. I think for that couple of hours you can almost de-stress as you’re concentrating on the weighing. I’m also told that other people say that it can help them forget their troubles for a little while. I’m as near as exact as possible when I’m weighing, so because of that concentration you’re not thinking of anything else, which is why it can be relaxing. I also think at the end of it we all seek praise; when you say to someone “Did you like that?” and you get the thumbs up the whole process is very rewarding. How did you progress from being a home baker to baking more formally and setting up Clandestine Cake Club? There was a movement in around 2009 for people to run supper clubs in their own home. There was nothing at all in Leeds, and I think I created the first afternoon tea room in my own home (called The Secret Tea Room). I did that from June 2010 for 2 years. At one of the events, I was listening to the conversation of the people at the table; it was the food and the baking that linked people together. They were all having conversation around the food and some people realised that they worked in the same building or knew similar people. I started thinking about how I could bring people together. I knew I couldn’t really do the afternoon teas more than once a month as it was really hard work and I had my family to look after as well. I looked on the internet for cake clubs and couldn’t find anything at all. I thought, well I’ll create one and see what happens. The first event was in December 2010. For 2 years from 2010 to 2012, I was doing an afternoon event for The Secret Tea Room in my own home, plus a Clandestine Cake Club event as well. Then, with social media being what it is, people started saying why don’t you come here or open a cake club there. Towards the early part of 2011 I wrote some very simple rules and guidelines to see if I could get other people to create their own clubs. Because the Clandestine Cake Club was taking off, I finished off The Secret Tea Room and focussed completely on the Clandestine Cake Club. What are the most important rules for Clandestine Cake Club? One of the most important rules is that we are non-competitive. There are lots of people who think they aren’t good enough. I’ve had people emailing me saying, “I’m just an amateur baker”, or not of the profession that they’ve seen on the website. I quickly put a stop to their concerns by saying that soggy bottoms and sunken middles are welcome. The other thing is that you have to make a whole cake. How I explain it to people is that there’s interaction and conversation when you cut the first slice of a whole cake. Take 2 tables, one full of whole cakes and one full of cupcakes, muffins, brownies – all the little singular cakes – and ask 2 different groups of people to take what they want, and go and sit down. I would pretty much guarantee that the people at the whole cake table will still be there, talking to each other, slicing cakes, as that’s what gets the conversation going. The people at the table with cupcakes and muffins will have already sat down; there’s no reason for them to talk to each other. What kind of cakes do you most enjoy making? I use my very basic simple recipe that I learned at school, using imperial measurements: 8 ounces each of flour, sugar, butter and 4 eggs. That’s the basis for which I make my cakes. So if it’s 6 ounces of flour, it’s 6, 6, 3 for the other ingredients. It’s not always easy to work out in grams! From the basic recipe you can either make a very simple cake with all sorts of fillings and dusted with icing sugar. Or you can take out some of the flour and add ground almonds. I like this very basic, simple sponge cake that I always adapt from, using all sorts of different flavours. You can also cover it with fondant or butter cream, or even meringue. How much do you like to experiment with your own basic recipe? I tend to experiment all the time. I create my own recipes for my cookbook or the blog, so will often think about how I can change a flavour, or if it’s possible to add moisture by adding ground almonds. And when you add grounds almonds they don’t really add much flavour, so you have to think about almond extract. And then I’ll think what else goes with those flavours? It depends on the season as well; for example, at Christmas time I might choose almonds and cranberries. I have lots and lots of cookery books. I usually get the ideas from other people’s recipes and cookbooks, and see how I can incorporate those flavours in my basic recipe. Sometimes it will work straight away, and other times not. For example, I once included sunflower oil and all you could taste was the oil. I always like to experiment, and sometimes its work and sometimes it doesn’t: that’s the nature of baking. How do you think you can encourage other people to experiment and be creative in this type of way? By helping people realise that it’s really quite easy. All you need is one basic recipe; it’s the foundation of anything. For the Clandestine Cake Club events, people will often use recipes from cookery books, which is really good and why cookery books are selling so well. But there only seem to be a few people who are very experienced at baking, and understand the science behind baking and can do it for themselves. To get people to understand it, you need to start with a very basic recipe and practise, for example, taking out some flour and replacing it with cocoa or some ground almonds. It’s giving people the confidence that they can do it themselves. It’s also about getting people to try things too. Someone can come to an event and be thinking of making a beetroot and chocolate cake, but have no idea what it tastes like. If another person has made one at the Cake Club events, you can taste and think, I can have a go at that. And people can swap ideas as well. People do need to experiment, but I understand it can also be quite expensive to experiment if you make a cake and it doesn’t turn out right. People are on a budget and don’t want to waste any ingredients, which is why people often turn to recipes that they know will work. 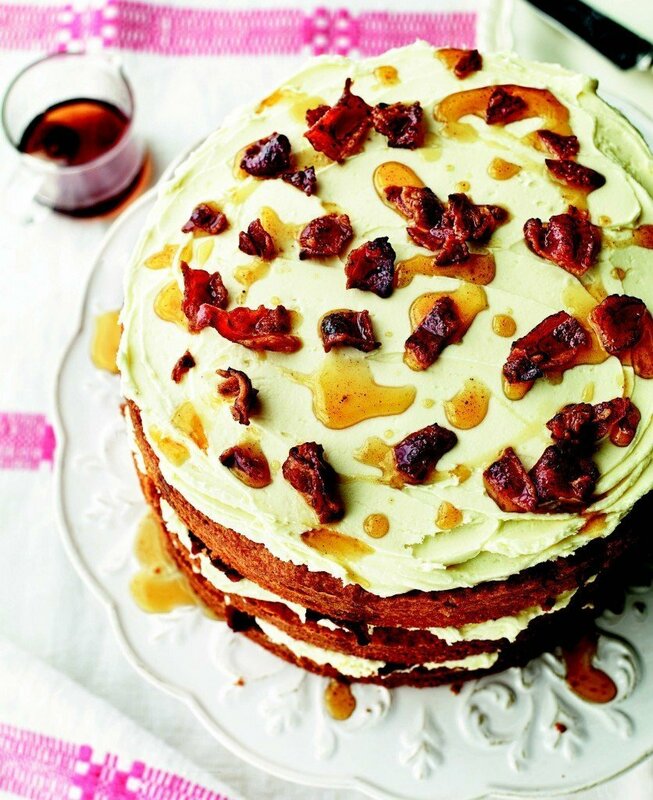 What’s the most unusual flavour that you’ve tasted at a Clandestine Cake Club meeting? There’s one that I’ve tasted twice and I’d have to say that it’s not a flavour that I’d go for, and that’s Tomato Soup Cake. It’s an acquired taste and I think if somewhere were to experiment with the recipe and get the right amount of tomato soup in, it could be quite good. But when you’re looking for cake and you think, well that looks like chocolate, but it doesn’t taste like chocolate, then it’s not one that I would recommend. I think you do literally put a tin of tomato soup in it. You need to have strong batter to accommodate the soup. I’ve never actually made one because I just know it won’t get eaten. But if someone could condense that tomato soup flavour it could work. It’s a bit like cooking with rosewater; if you put too much in it tastes like bath water, but if it’s just right it works. I think the soup could also work if you made it into a savoury loaf. What are your top 2 to 3 baking tips? I would advise people to invest in an oven thermometer; they’re only around £5. I would use it every single time. Even if an oven is only 5 degrees out, it can make an awful lot of difference. People need to realise ovens are different. When a recipes says bake for 25 minutes, that is only an indication. If you’re oven is hotter or cooler than that, the time will be different. There’s a risk when your oven is too hot that the cake could burn, but knowing this comes with experience and knowing your oven well. I would also invest in some good quality baking tins. And to help stop the top of a cake turning too dark when it starts to look a bit brown, cover the cake tin with a bit of baking parchment when the cake is about cooked half way. It still rises, but keeps a little bit of steam in, and prevents the cake going too brown or burning. If you have a fan-assisted oven, the very thin baking parchment can blow away, but you can also buy reusable sheets that are a bit heavier (and washable). And only open the oven door when the cake is half to three quarters baked or you’ll lose the heat. What food or baking trends are you most interested in? There’s a lot of talk about sugar substitutes, which I don’t use. Artificial sugar is by its very nature artificial; it doesn’t taste good. I think if you’re going to have a slice of cake, have a slice of cake. If you go to a Cake Club event, it’s only once a month. I’ve found that even when you reduce fat it takes a lot of the flavour away. For healthier eating, just have a finger slice, and go out and run or walk a bit. Life’s a bit too short not to have a slice of cake every once in a while! There’s a lot of talk about healthy eating. One of the ways to get health into a cake is to add vegetables. We all say yum to a carrot cake, but when you mention beetroot, courgettes and parsnips to some people, they think “Crikey!”. But it’s no different from a carrot cake and you don’t really taste the courgettes or parsnips, or even the beetroot to some extent. You know there’s a texture there and adding the spices and other flavours enhances it. So although you’re eating some sugar, there’ll still be some amount of vegetables in there, whether you use them grated or cooked. 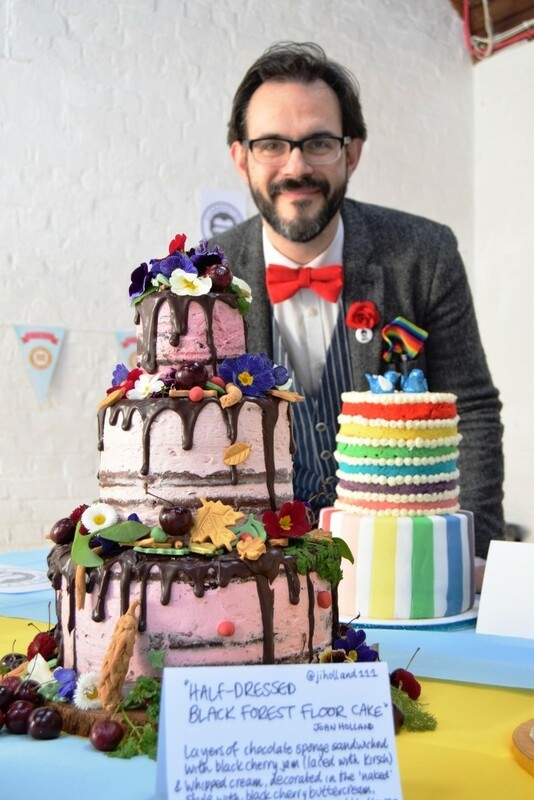 What about any flavour trends you’ve noticed at the Cake Club events? I think people are moving more towards the vegetables. People are also experimenting more. Some members have allotments and are using what they’ve grown in their cakes. They are also using fresh lemon zest and juice, and oranges, so are getting away from the very plain Victoria sponge. There’s even a recipe in the Cake Club cookery book using chilli and chocolate. Tea loaves are hugely popular. They come around at different times of the year. There’s a recipe on the website that doesn’t have any butter, so for anyone who is dairy intolerant it’s ideal – and it’s very easy to make. The other thing that’s become increasingly popular is using bundt tins. They make beautiful cakes and are perfect for anyone who is not very good at decorating. You can also use a very simple cake mixture, though not the traditional Victoria sandwich as it has to be a substantial cake batter for it to take the shape of the tin. You will probably see at least one bundt cake at a Cake Club event. They can be simply drizzled with chocolate at this time of the year, or in summer time with a simple icing. The other thing that’s popular at the moment is drip cakes. They tend to be 2 or 3 layers tall and then finely dressed with butter cream. Once that’s set you get a chocolate ganache and just pour it over the top. There’s a skill in being able to do that and getting the ganache at the right consistency so that it stops half way down the cake. You’ve also released a couple of cookery books. Tell me a little more about them. The first one came out in February 2013 and the latest one, A Year Of Cake, came out in September 2015. I was approached about doing a book within the first few months of Cake Club in 2011. It was a literary agent who approached me and if he hadn’t been in touch, I probably wouldn’t have even thought about doing the book! It’s not easy to get a cookbook done unless you have a particularly good agent. We spent the whole year creating proposals and drafts. From start to finish, for each one it’s taken about 2 years. Each book is a collection of recipes from members and about 25 percent is my recipes. For A Year Of Cake we spent quite some time choosing the right celebratory dates that most people would know about. When you look at the recipe, you’ll realise that each one will have a connection with the date either within the title or the ingredients themselves. For example, there’s one for Elvis Presley’s birthday and that’s based on his favourite cake. It wasn’t just any old recipe plucked to match any old celebration date; there had to be some connection somewhere, so that took quite a bit of doing. We’re actually having a Bake Along on the website at the moment. We have a book club and during particular months, members are baking a recipe from the latest cookbook as a bit of fun. It’s another way of getting people involved in baking.